Structure My Deal tools are complete — you're ready to visit Larry H Miller Chrysler Jeep Dodge Ram Bountiful! 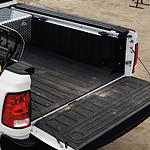 There are many things to consider when choosing a truck, and its durability should be one of the main concerns. The 2018 Ram 2500 was built to withstand any type of driving conditions with special features to keep it functioning smoothly for a long time. The entire truck is based around a 50,000-psi steel frame that provides for secure placement points for all of the other components. The 6.7L Cummins Turbo Diesel I6 engine is equipped with Smart Diesel Exhaust Engine Braking Technology to reduce the wear on your brakes and help you control your speed on long and steep downhill slopes. To take a new Ram 2500 out for a test drive, visit Larry H. Miller Chrysler Jeep Dodge Ram Bountiful today. We'll set you up with the right truck for your driving needs and let you experience the Ram 2500 for yourself. Larry H. Miller Chrysler Jeep Dodge Ram Bountiful is your first choice for a superior car buying experience. We are Northern Utah's choice to all their complete Jeep needs where you can find everything you need for your next adventure.